After last night's drama, today starts off a lot better. 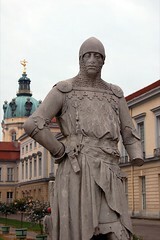 Since I'm not leaving till late I'll be spending most of the day exploring Berlin. I've decided to leave my smallest bag here at the hotel and go to the station and drop off my larger bag. It means when I come back I'll be able to safer store my camera gear and only drag one little bag to the station through the crowded streets. I have a very early breakfast - I'm the only one in there - people only start arriving just before I leave. At 8.30am I'm in front of the Post Office to mail off some books I've gathered on the way. I don't need to carry extra weight around - I'm pleasantly surprised at how cheap the postage is - I'll be doing more of this during the trip. When I check out I've made a booking for my return - I really can't complain about the hotel, position wise it's very convenient, the rooms are very large and comfortable, the staff are friendly. 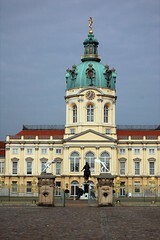 First stop today is the Schloss Charlottenburg. Once again it's a bus trip - from Berlin Zoo (where I've just deposited my bag at left luggage) it's route 145 and it drops you off right in front of the place. And what a place it is! 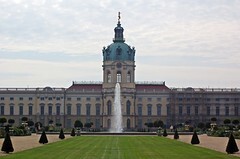 It's the largest palace in Germany and was supposed to be the summer home for the wife (Sophie Charlotte) of Friedrich III. 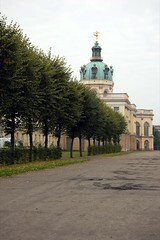 Built in stages from 1695 to 1746 it was damaged during the war and has been subsequently restored. It's a great pity that you can't photograph the interior because it truly is stunning. Words can't do it justice - it's just an unbelievable experience to stand in these enormous and elaborate state rooms. Liberace would love it - with it's marble and alabaster walls - that's right the walls are marble! It's a self guided tour and you get an audio guide that I'm sure is voiced by Penelope Keith and Jean-Luc, umm Patrick Stewart (if it's not Patrick Stewart it's someone with his voice). I find myself rewinding just to hear his voice. I know, pathetic isn't it. Actually on the tape you've given the opportunity to hear more about the building - I always went for that option. One of the decorations I especially liked and had never seen before was silver gilding. It's so beautiful. 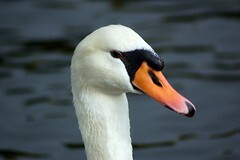 Apparently when the king was younger he quite fancied the look but as he aged he was turned by gold gilding. 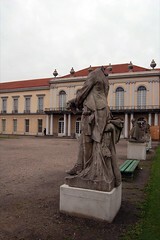 This rather modest building is the Neuer Pavilion/Schinkelpavillon) - there are displays of furniture, pictures and sculptures from the early 19th century. and this is the reverse view. 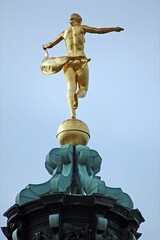 The gold plated statue of the Goddess Fortuna - its a replacement by Richard Scheibe, the original was destroyed during the war. 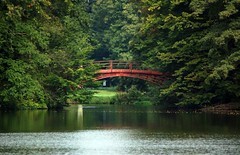 The gardens are enormous and beautifully maintained with plenty of spots to sit and take it all in. 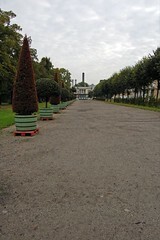 After whiling away a few hours here I decide to lunch at an "Italian" place just across the road from the Schloss. I ordered a chicken involtini with a glass of frascati and water. The cooked part of the chicken was nice - the raw bits in the thick middle section were an unwelcome surprise. Maybe it was the wine or the raw chicken but I was feeling slightly warm. As I popped out of the restaurant I watched the bus zip past. Doh! Fortunately you don't need to wait very long - maybe 5 minutes for the next one. Brilliant timing saw my arrival back at Berlin Zoo coincide with the imminent departure of Bus 100 - I was going to have a closer look at the the Marienkircke and the Rote Rathaus. This trip also gave me the opportunity to see how close the bus actually takes you to the Reichstag, now that the streets have been reopened after the festival. This is definitely the way to travel - I wasted a lot of time on the underground when I could have got there directly using the bus. Marienkirche (St Mary's Church) was surprisingly free to entry with the only condition being no flash photography. 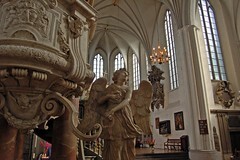 It was first established as a parish church in the late 13th Century and is Berlin's second oldest church. Building commenced in 1280 and was completed by the early 14th century. 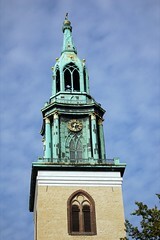 The tower was added in the 15th century and it was topped with a crown in 1790. 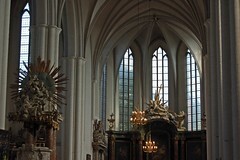 The Baroque Altar (background) was designed by Andreas Krüger. 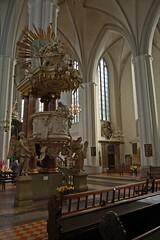 Alabaster pulpit dates from 1703 carved by Andreas Schlüter and is decorated with bas-reliefs of St John the Baptist. Having enjoyed by visit, I picked up a booklet about the church and a little folding wooden icon - feeling even more charitable I even gave some money to the toothless woman begging outside the church. I managed a few shots of the Rote Rathaus - unfortunately by this time of the day, it was a little overpopulated to get any decent shots. 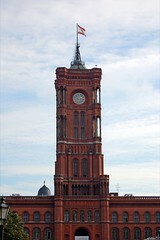 The Rote Rathaus (Red Town Hall) was inspired by Italian renaissance architecture and constructed between 1861-1869. 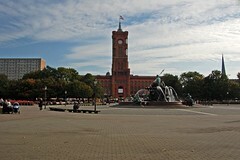 It was damaged during the war and rebuilt from 1951-1958 where it was the seat for the East German authorities. 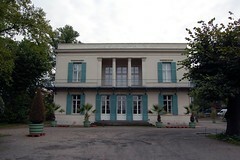 After reunification in 1990 it houses the offices of the mayor and cabinet. 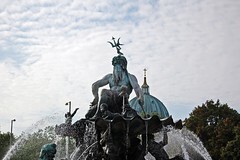 A large fountain of Neptune (Neptunbrunnen) sits in the plaza between the Rote Rathaus and Marienkirche. Designed by Reinhold Begas and created in 1886-18891 it consists of ten meter high statue of Neptune reclining on a shell that is supported by nymphs and tritons. 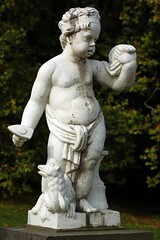 It was moved to its current position in 1969. It's been quite a productive day but it's time to hop back on the bus and return to the hotel to get my bag. Berlin Zoo has a DB lounge that says is open to holders of 1st class tickets - well, not all 1st class tickets are equal - my ticket for example didn't allow entry. It would appear that it's really only for germans. So being excluded I've had to drop off my smaller bag at left luggage as well since I've got three and a half hours to kill. The station is appropriately named - it's a zoo. For such a major hub it's a major circus. Have a guess how many seats are available for those waiting? Not you Paalo - you know the answer. There are exactly ten! What they want you to do is mill around in large groups to make it easier for the pickpockets to ply their trade. But they are kind enough to post signs warning you of this occurrence. Good one, Berlin Zoo. Another thing is that if you want "to spend a penny" it's more a case of spending one euro ten. Money, I consider very well spent. The McClean facilities are incredibly clean with their space age self cleaning cubicles - a considerable advantage having observed normal german toilet habits. The positioning of the Pissoir however, with it's slanted windows is suspect - walk past with one eye shut so you don't get an unwelcome view. There's also some perplexed tourists unsure of where they should go - "Damen" is not german hiphop talk for man, but actually means Women. 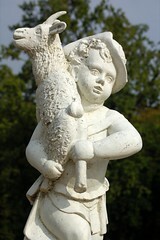 Likewise "Herren" means Men. I must admit the little figures next to the words really came in handy. Since I have time I decide to check with the Eurail office at the station to find out if my ticket is for a room with a bathroom or if there are any rooms available with a bathroom. My original ticket was for a room with a bathroom but it didn't appear that the new booking does. I wait while the guy behind the counter deals with a couple of customers. Assuming it's my turn, he looks straight at me so I stand up. He then grabs the phone and decides to have a good old gossip session. He's prattling on about the name of a previous customer and how absolutely hilarious it was - what a professional I thought to myself - no wonder he had to come to Germany to get a job. He then went on and on about evil amerikkka and chimpy mchaliburton bushitler. Good grief, I bet he's the one that goes to Brussels and apologises. Eventually he decided to go back to work - by this stage another two people were waiting. He stared at the ticket and just replied "I don't know" to my questions - perhaps he was trying to use ESP. Reluctantly he relented and actually moved his sausage fingers across the keyboard - by this stage I was expecting him to say "the computer says no". The end result is that I killed half an hour but left the (no)help desk with no more information than I had last night. 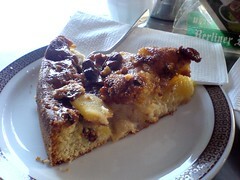 I then went to one of the station cafe's to wile away the hours and settled back with a latte macchiato and a "stück of apfelkuchen mit sahne." That's at least one phrase I know in german. 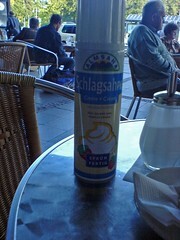 instead of fresh cream I got this can of cream - I just love how it has "real imitation vanilla flavour"! 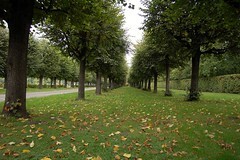 While I seated outside a lovely woman was getting her son to do 1's and 2's against a tree. The people seated at the tables in front of me probably would have got audio with their visual experience. But not as good an experience as the owner of the bicycle that had been chained up to that tree, they might need to take a little extra time to extricate their bike from the human effluent. I'm sure one day he'll do his mum proud and piss up against the station, like the big boys do.